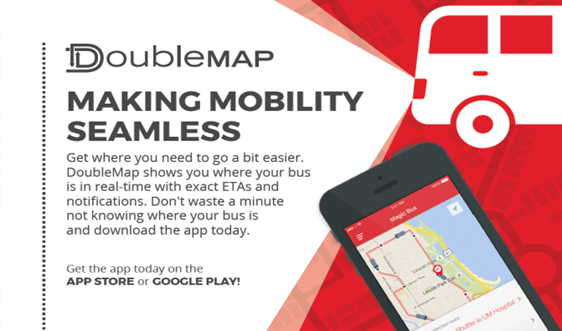 DoubleMap, the real-time shuttle tracking service, is now available for the SMU Express (768) and Museum Express (743) shuttles. You can easily track the SMU shuttles via the SMU DoubleMap website at smu.doublemap.com or with the free DoubleMap mobile apps. Download the DoubleMap app from the AppStore or Google Play or use the website at smu.doublemap.com. 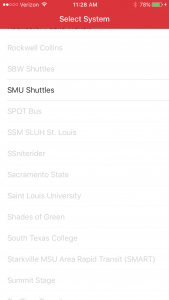 Launch the app/website and select SMU Shuttles from the list of bus systems. 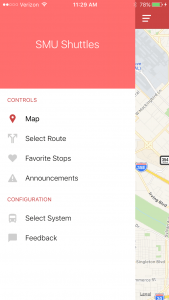 You can show and hide individual routes on the map (sidebar switches on the web, Routes menu on mobile). DoubleMap will remember what routes you choose for the next time you open it. Click on a stop to see the stop name and the estimate of when the next buses arrive (coming soon). 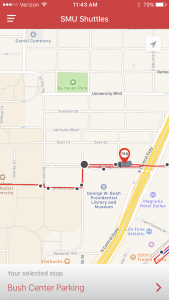 To locate your bus on a route; look for the moving pin with the route number or letter on it. If you have any questions about the DoubleMap real-time shuttle tracking service, please contact SMU Parking and ID Card Services Office at parking@smu.edu or 214-768-7275.